There’s nothing like the feeling of new hair extensions. 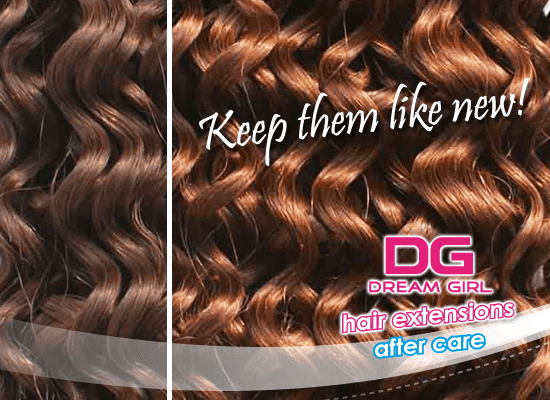 DreamGirl loves the feeling of luscious hair feeling thick and volumised. But just like your natural hair, hair extensions need looking after to keep them looking as fresh as they did on day one. And hot weather or being on holiday and swimming in salty or chlorine water can leave your hair extensions dry and in need of a little TLC. Here are some tips on how to keep your extensions, whether sewn in or Clip’N Go, in great shape. Keep tangle free: Just like your natural hair it can look weighed down or lank when not kept tangle free. Comb carefully with a natural bristled brush. If you use Clip’N Go Hair Extensions comb before and after application. You should make sure your hair extensions are detangled before you wash them. Wash regularly: Whether synthetic or made of human hair your extensions need to be washed to keep them free of the dirt and sweat you pick up when out and about. Traffic fumes, dirt and grime, it all weighs your hair down and can damage the roots and tips. To wash don’t soak the hair as if it’s dry this can leave it more tangled and you could risk damaging the cuticles or ends by making hair too knotted. Instead rinse carefully, beginning at the roots and working down to the tip. Use the right products: Some hair products can be too harsh for hair extensions. Human hair extensions are treated before being manufactured and the chemicals and detergents used in regular shampoo can strip away the hair’s natural oil making your extensions lose their shine and look lank. Use a shampoo and conditioner specifically designed for hair extensions. Shampoo carefully, using only a pea-sized amount and gently massage into the hair. Rinse carefully before applying conditioner working into the tips before using sparingly on the roots. For Clip’N Go Hair Extensions you can detach before gentle washing. Style on a low heat: High temperatures can damage hair. It’s best to leave hair extensions to dry naturally, combing gently after washing. You can blow-dry but keep on a low setting. Regular upkeep will make sure you keep your hair extensions looking as good as new every time you wear them. Everyone at DreamGirl is really excited because this week we launched our New Face competition. Sponsored by O’Sullivan Concept Salons we’re looking for one lucky girl to represent DreamGirl in photoshoots and at events. It is a great opportunity for anyone who wants to get a foothold in fashion or muses about being a model. So we thought, if you are thinking about entering, we’d offer some advice about the best ways to get into the industry. Being a top model isn’t all about fame and glamour. Models work really hard. It’s long hours and you always have to bring your A game. You have to look after yourself so a good diet, plenty of fruit and veg (vitamins B and C are great for healthy hair as well) and plenty of water to keep your skin clear. Model agencies will help put you in touch with the right people, particularly photographers, but there are loads of scams out there. It’s so important to do your research. Find out what people think are the best agencies. Don’t sign with someone who asks for loads of cash to be handed over. Plus never get yourself into a situation where you feel uncomfortable and unsafe. Some agencies recommend younger models should always bring a chaperone with them if they’re unsure. An agency won’t often need a professional, bulging portfolio. They’ll just want some simple snaps of you so they can get an idea of your look. It’s important that a model is comfortable infront of the camera. Pose, get a sense of your best angles, how your face works and how to catch the light. It’s also not just about being a diva. Supermodels might be able to get away with it, sometimes, but for everyone else they want to work with someone who’s chatty, friendly and confident. So if you think you have what it takes get in touch and see if becoming the New Face of DreamGirl could be the start of your modelling career. Curly, straight, wavy, volumised or brightly coloured. Hair extensions can help you transform your look. Synthetic or human hair? Clip on or glue? The most important things to consider are how long you want to wear your extensions for, what your budget is and most importantly what you want the finished product to be like? Human hair looks more natural. Dream Girl’s 100% human hair extensions blend with natural hair, easier to maintain, wash with natural hair, style as normal with hair extension suitable products. At Dream Girl we ensure the cuticle remains intact. With Remi Silky hair extensions, for example, the root point and cuticle is intact. Each of the roots points the same way for a more natural look and feel. It also helps the hair remain tangle free for longer. 100% human hair extensions can be more expensive than the synthetic option. While it might not look as natural, synthetic extensions are perfect if you want to style your hair for an event or night out and are looking for it to hold its shape. For clip on or glue, it depends on your lifestyle. If you follow the instructions carefully at home, or visit a salon, hair extensions can be glued to offer a more secure fit and natural look. By definition, these are usually extensions designed to be worn for a longer period of time. Clip N’Go extensions are versatile easy to fit and remove yourself. Whether adding extra volume, highlights or colour they are easy to fit and apply. Read through our step by step guide here. Hair extensions are the quickest way to a whole new you. Lady Gaga is known for transforming her style as much as she is her music. Rihanna’s image is one of a feisty, confident woman, not afraid of expressing herself. Changing your look can be empowering, inspiring and can reveal a whole new you. But you might not want to commit to a full head colour. You might be worried the damage it will do to your hair, you might be worried the boss wouldn’t be happy. Wigs offer the perfect solution. High quality, available in a range of styles and colours you can transform your look in an instant. Dream Girl wigs are available in either synthetic or human hair. They are finely wefted which means the hair will fall more naturally and creates a more natural look. Durable and easy to look after, wigs offer the easiest solution if you want to change your style on a Saturday night, or just make yourself feel a little more confident. A wig is perfect if you want to conceal thinning or fine hair. There are things to consider just like there are when you want to transform your own hair. Here’s our nifty guide to make sure you get the wig of your dreams. Work with a style that suits your face. You might want a bold and bright colour but you also want it to look as natural as possible. Be eye-catching for all the right reasons. To protect your own tresses, cover you hair with a cap or tie back securely. Not only will this make sure your hair isn’t damaged, it will make the wig sit more comfortably in place. Any lumps or bumps and the wig might not look smooth and natural. Vibrant colours make you stand out from the crowd, but when picking a red tone think about your skin colour. Do you suit more orangey or pinky reds? It’s the same test you use when you try out a new lip colour. Try it on; if you look washed out or pale then the colour doesn’t suit your skin tone. Select a wig that matches the texture of your own hair as closely as possible. If you hair is thick and textured a fine hair style might not sit evenly. Experiment with different styles like curls but run your fingers through the hair. You want to be able to give yourself a natural tousled look. Too well styled might look more fake. It’s best to give your wig a full workout before you head out, particularly if you’re planning on hitting the dancefloor. Is it secure? Are you confident it will stay in place? Transforming your look with a Dream Girl wig is the fastest way to boost your confidence and unveil a whole new you.